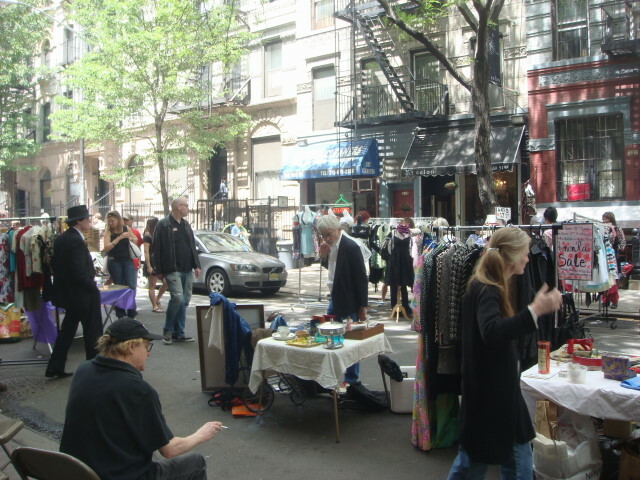 I usually hate street fairs. If I need a pair of socks, I’ll go to a store. I don’t like to eat the food at them as it looks…a little unclean. 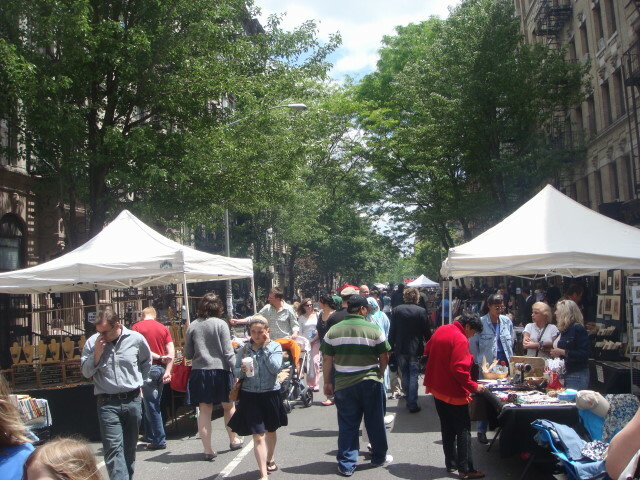 But there are some good street fairs. They’re the ones that keep out the sock merchants and the gyro places and the like. I’ve really only known one: in the West Village. And now I know a second. 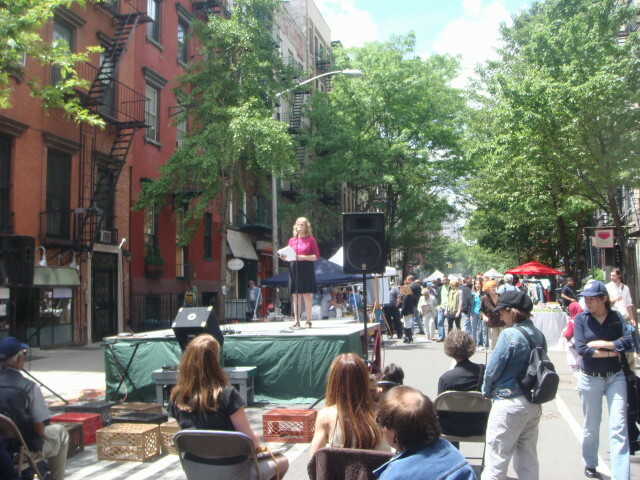 The 10th Street street fair between 1st Avenue and 2nd Avenue was quite good and nicely done. They had a couple of the usual horrible merchants. But mostly it was artists and homeowners selling stuff out of their homes like a garage sale. Well, this was pretty good garage sale stuff. I saw a bunch of LPs and the like. I think a number of the people were artists. The area is pretty artistic, so I presume that they were the participants. The most interesting stuff was some presentations by actors and poets. They seem to be associated with the Theater for the New City, which is where each of them emerged from to give their recital. 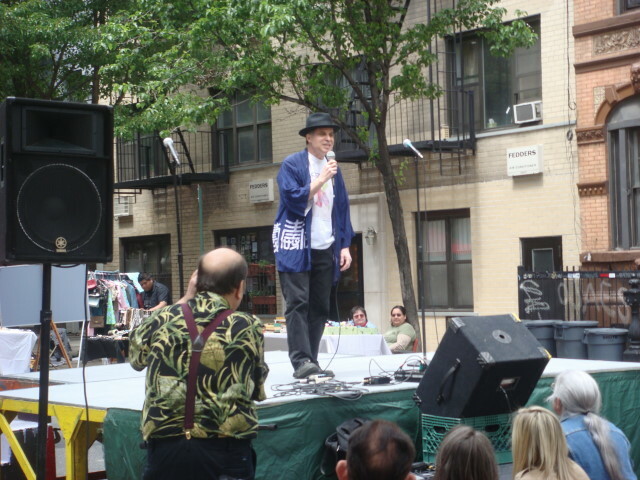 This guy was doing a Shakespearean-style speech. I came in late on it and didn’t recognize it. He seemed very sort of old-school Shakespearean. That is, very deliberate and systematic recital; a recital for a real audience and not for the inner muse sort of thing. There were a couple of poets that came up afterwards. Very…typical. This poet gave a recital of a work about people who accomplish things and ends with a Wall Street type who is mulling over who to put out of business. Bleh. And then there was the poet in the picture below. He’s the very first poet I have ever heard who used sound effects as part of his recital. He seems to have hooked up some sort of echo process to the amplifier. It was nifty, but awfully artificial. Of course, maybe that was his point. 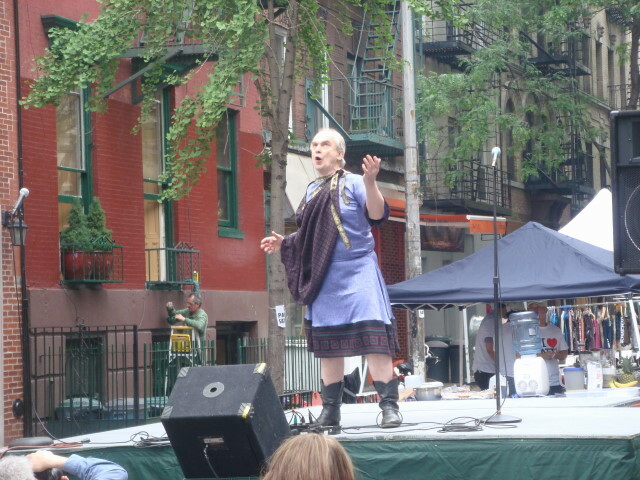 This entry was posted on May 30, 2008 at 5:48 pm and is filed under Events, Greenwich Village, LES, Manhattan, Wanderings. You can subscribe via RSS 2.0 feed to this post's comments. You can comment below, or link to this permanent URL from your own site.